An investigation into the evolution of human walking by looking at how chimpanzees walk on two legs is the subject of a new research paper published in the March 2017 issue of Journal of Human Evolution. The human foot is distinguished from the feet of all other primates by the presence of a longitudinal arch, which spans numerous joints and bones of the midfoot region and is thought to stiffen the foot. This structure is thought to be a critical adaptation for bipedal locomotion, or walking on two legs, in part because this arch is absent from the feet of humans' closest living relatives, the African apes. In contrast, African apes have long been thought to have highly mobile foot joints for climbing tree trunks and grasping branches, although few detailed quantitative studies have been carried out to confirm these beliefs. But now, Nathan Thompson, Ph.D., assistant professor of Anatomy at New York Institute of Technology College of Osteopathic Medicine (NYITCOM), is one of the researchers questioning some long-held ideas about the function and evolution of the human foot by investigating how chimpanzees use their feet when walking on two legs. The research team, including members Nicholas Holowka, Ph.D. (Harvard University); Brigitte Demes, Ph.D. (Stony Brook University School of Medicine); and Matthew O'Neill, Ph.D. (University of Arizona College of Medicine, Phoenix), conducted the research and collected data while all were at Stony Brook University (2013-2015). Most researchers studying human evolution assume a stark dichotomy between human and chimpanzee feet. One is a rigid lever that makes walking long distances easy and efficient. The other one is a grasping device, much more mobile and less effective at walking on two legs. Fossil feet of early human ancestors are nearly always compared with chimpanzee feet, making knowledge of their foot biomechanics crucial for understanding how the human foot evolved. 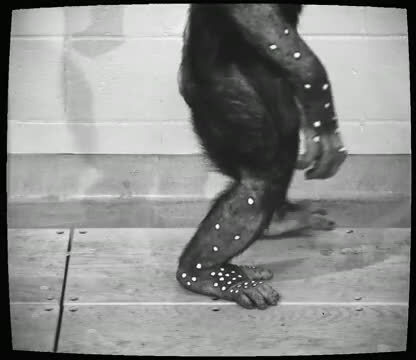 However, prior to this research, no one has been able to actually investigate whether differences existed between humans and chimpanzees in how the foot works during walking on two legs. To find out, this research team used high-speed motion capture to measure three-dimensional foot motion in chimpanzees and humans walking at similar speeds. They then compared ranges of midfoot motion between species. Contrary to expectations, the researchers found that human feet are more—not less—mobile than chimpanzees walking on two limbs. 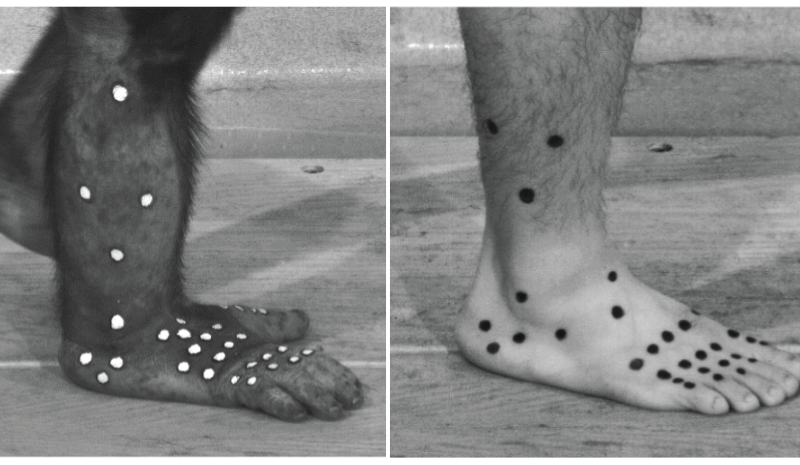 "This finding upended our assumptions about how the feet of both humans and chimpanzees work. Based on simple visual observation, we've long known that human feet are stiffer than those of chimpanzees and other apes when the heel is first lifted off the ground in a walking step. What surprised us was that the human midfoot region flexes dramatically at the end of a step as the foot's arch springs back into place following its compression during weight-bearing. 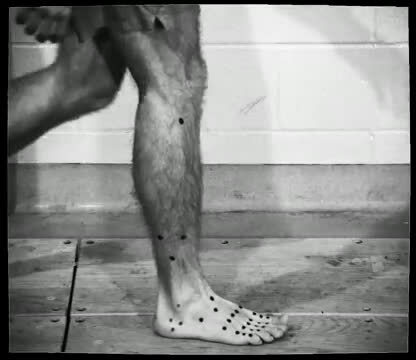 This flexion motion is greater than the entire range of motion in the chimpanzee midfoot joints during a walking step, leading us to conclude that high midfoot joint mobility is actually advantageous for human walking. We never would have discovered this without being able to study chimpanzees with advanced motion capture technology," said Holowka, with Harvard's department of Human Evolutionary Biology. Ultimately, according to the findings, the fact that the traditional dichotomy between humans and chimpanzees has been disproven means that researchers may have to rethink what can be learned from the fossil feet of humans' earliest ancestors. "The presence of human-like midfoot joint morphology in fossil hominins can no longer be taken as indicating foot rigidity, but it may tell us about the evolution of human-like enhanced push off mechanics," said NYITCOM's Thompson. Based on these findings, the researchers encourage future studies to consider the ways in which human foot morphology reflects longitudinal arch function throughout the full duration of stance phase, especially at the beginning and end of a step. Thompson added, "One of the things that is really remarkable about this project is that it shows us how much we have still to learn about our closest relatives. It seems like the more we learn about how chimpanzees move, the more we have to rethink some of the assumptions that paleoanthropologists have held on to for decades." Clearly the feet of humans and chimpanzees are vastly different. They were created that way - no evolution required. Only those who chose to believe that life poofed into existence all by itself via purely random chemical and physical processes with no outside help make apes of themselves by calling on their supposed earlier common ancestor. That ancestor is not going to help one bit - it doesn't exist. So, we don't share our feet with them, but we do share over 98% of our DNA? So your god person decided that he'd make a special effort on the feet, but then just got bloody lazy when it came to the DNA? Yep, right. Methinks that you haven't thought this through. Unsurprisingly. He also gave chimpanzees a decent brain. For better, in fact, than those he decided to hand out to many of the YECs and IDers I've come across! !